The new Senna Special Edition by Tag Heuer is the casual sports watch for a fast-paced life . Featuring a sleek black opalin dial with the Senna logo at 6 o'clock and a date window at 4 o'clock, red accents and 3 counters. This 43mm case is crafted from stainless steel with black PV coating and a steel circular tachymeter fixed bezel with the SENNA logo. Powered by TAG Heuer's quartz movement, and a black and red rubber strap - this is the perfect timepiece for Formula 1 and watch fans alike. 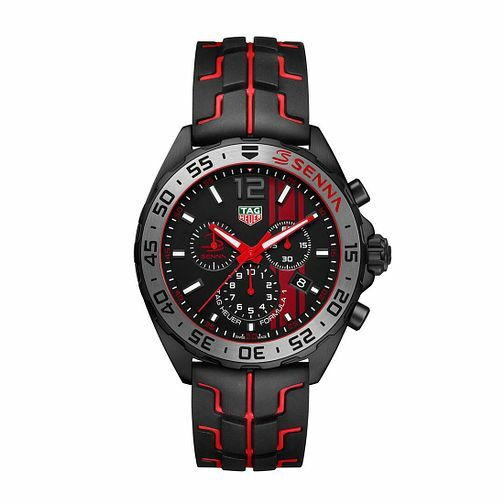 TAG Heuer Formula 1 Men's Black Rubber Strap Watch is rated 4.0 out of 5 by 1.